Your customer needs a folder to organize materials for their next promotion. However, taking steps to preserve the environment is important to your customer as well. An eco-friendly folder is your answer - and one that gives you the opportunity to proudly display their brand image without sacrificing color or image accuracy is possible with the Envirofolder Premium. Also known as the EFP. 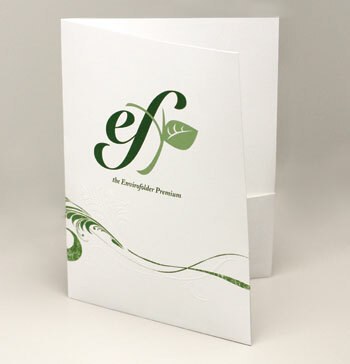 Seeing the EFP is a white folder, it provides you with more options for imprint ability. More options gives you more opportunity to show your customers that the EFP can be an impressive, eco-friendly way to display products and/or services. So whether being green is part of a marketing agenda or your customer simply wants to feel like their doing their part to better the earth, the EFP gives you both options.